Now that I’ve had a few days to digest the race and effort, I am very happy with both the journey and the outcome this past Saturday at the Diablo Challenge 50k. First–The Outcome—My first ever top 10 finish in an Ultra. 5th overall and 2nd in my age group–my first age group award for an Ultra as well. Now for the Journey–Wow was it HOT!!! I anticipated a hot day–like 85 or so but wow—it had to be in the mid 90’s out there in the sunny (no shade anywhere to be found) East Bay Hills. When I woke up race morning, I had the feeling that something was wrong and it only took me about 30 seconds to confirm my fear—I left the clip that keeps the hydration closed back in Hawaii–Nice move Michael. On a day with record heat, I thought it could prove to be costly–but in the long run, it saved me big time! More on that in a bit. P had the idea to duct tape the bladder shut and the plan worked. I laid out a hydration plan…wear the Nathan hydration pack filled with Secret Drink Mix from SkratchLabs until the 15.6 mile aid station. At that point, I would meet P, give her the vest with the duct-taped bladder and then run with a hand-held bottle for the rest of the race–refilling at each aid station for the rest of the way. This along with 2 salts every 45 minutes. The race plan—I knew there were plenty of really good runners in the field so I just wanted to hang in the top 10 and find some cool people to run with. I settled into 2nd/3rd place with Bay Area Ultra Rock Star Mark Tanaka. Mark and I settled into a nice pace and carried on a pretty cool conversation. He is certainly somebody that can teach me a ton about this Ultra thing so I made sure to pay attention. We gapped the rest of the field after a few miles and we found ourselves cruising up a few really tough climbs. I was feeling pretty decent on the climbs and more fit than I had anticipated. Mark told me that I was climbing really well for a guy my size–I love hearing that! You see at 6’1″ and 175-180 pounds, I am a little bigger than the average guy running near the front of an Ultra. Anyway, I broke away from Mark on one of the steeper climbs and put some time on him heading into the 15.6 aid station in 2nd place. I was looking forward to seeing P, swapping the pack for a bottle, and continuing on my great run. However, this did not quite happen. As it turns out, the 15.6 mile aid station was quite difficult to find. The race did not provide any sort of directions to the aid station (if you read her posts during the race, you can probably sense the frustration). So, there I am having a great run but it is getting hot and I have no way to carry the fluids that I will need to compete. I was a bit upset at the situation and it took me a while to wrap my head around it. Mark came and left the aid station. What to do….Thankfully, one of the guys working the aid station had duct tape so we filled up with water and off I went. At this point, I had no idea where or if I would see P on the race course again. I was still feeling ok and I was mad, not at P, but at the situation. I was able to catch Mark for a little bit but then he dropped me. I was starting to feel a little bit of pre-cramping in my calf. I kept up on my salt tablet as planned–2 pills every 45 minutes and hoped that I could hold off the cramps. I decided I needed to calm myself down and slow down a little bit. I kept Mark within my sights for quite a bit and I felt like I could still hold on for a solid run. However, things started getting a bit tougher after about 25 miles. The cramping started and I was suffering from some heat issues as the miles progressed. In between 25 and 28 miles (I think) I was passed by 2 guys and I was in some trouble. I was walking at this point and just wanted to make it to the final aid station just past 28 miles. P saw me walking up the hill to the aid station and she knew something was wrong. She said it was the worst she had ever seen me look. I almost dropped out–but instead I sat in a chair for a bit, drank a ton, and soaked myself with ice water sponges. 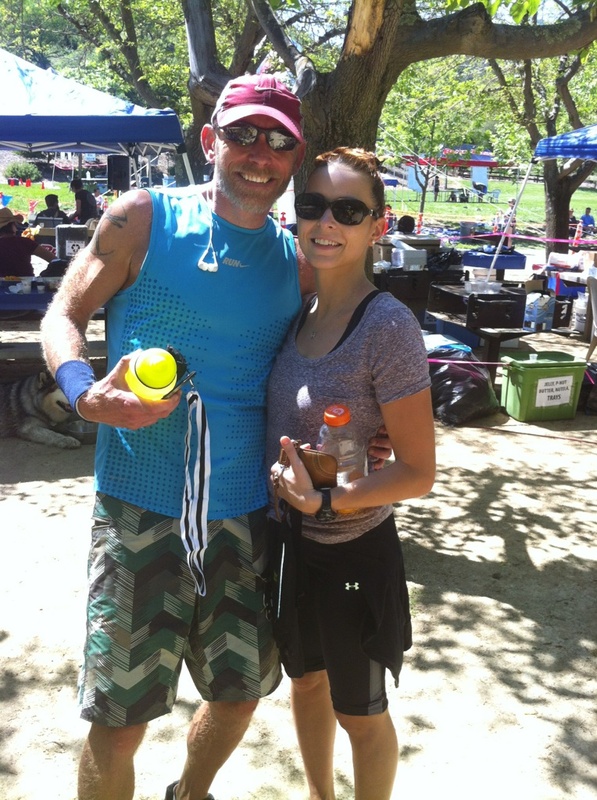 Sometime along the way, Sean Blanton–another Rock Star Ultra runner–rolled into the aid station. I was clueless. After about 10-15 minutes, I made the move and proclaimed “Number 28 I walked in but I’m running out!”–In the background, R.E.M’s “What’s the Frequency Kenneth” played–What a great song! I was soon joined on the journey by Sean. He is a super cool guy and a really good runner as well. 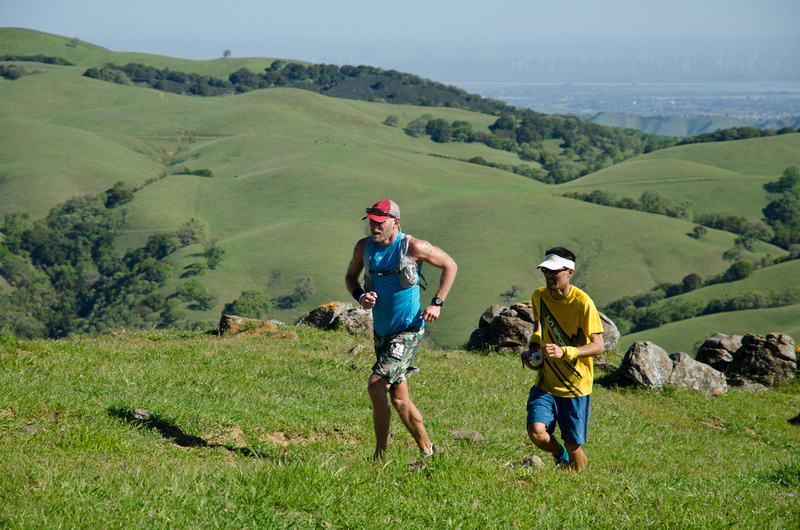 He is training for a run at the Appalachian Trail Record–wow! Anyway, we talked the whole way into the finish. Sean–Thanks so much for the company! Run to the Sun here we come! The journey was complete and I owe a ton of thanks to P as well as my new Ultra friends Mark and Sean. Post-race I was pretty knackered physically and mentally. The race was much tougher than I had anticipated and I was spent. Instead of the post-race BBQ with friends, we headed back to the house, shower, grabbed a quick bite and then took a long nap. I am happy to be ahead of schedule with my fitness but I need to be careful when I head to Miwok in 2 weeks. Out slow and relax. The goal will just be to have a nice run at my first 100k effort. I feel good now after a nice 11 miler and a 2 hour massage with Barbara. Thanks for all the love, kindness, and support. We are all getting better every day! I almost forgot—If I would have been able to leave the vest at 15.6 miles—-I would have been toast for sure. One bottle each station would certainly not been enough. Way to go, Michael! Wow! The liquid logistics seem almost as tough as the running bit (almost. . .). Well done! Micheal! Great effort! I am proud of you. Top five in the heat with a bunch of studs out there is quite impressive. Well done TeamG! 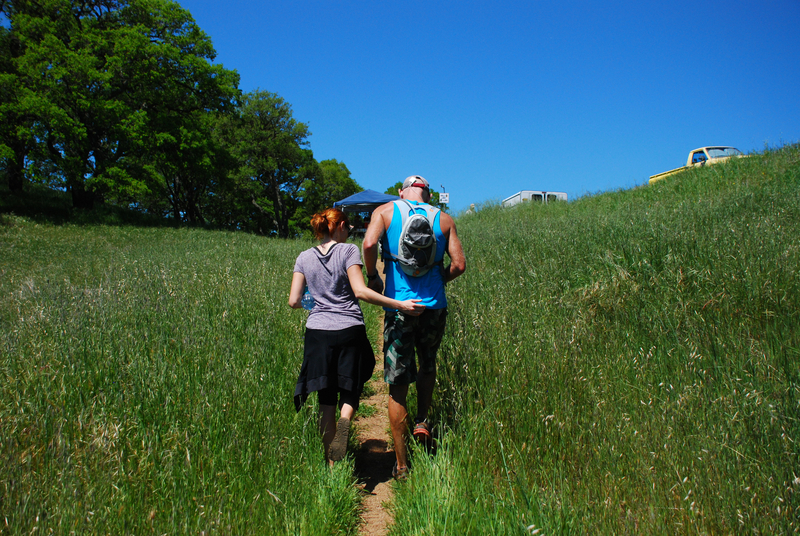 Still thinking about RR100 and your fall that could have burst the hydration pack bladder. Like you said, you may have been done at that point. This is the second race in a row disaster nearly struck because of the the hydration pack. I suggest bring a second hydration pack. Then you’ll have a backup that Paula could even have ready for rotation at the aid stations. A backup keeps you in the race if something goes wrong with the other one. Thanks for the tip Cuz. I stopped by Runner’s Hi today in Aiea and picked up a new Nathan Endurance Hydration pack. I will use both that and my Nathan HPL-20 pack this weekend at Miwok. I was also very happy to see Skratch Lab Secret Drink mix available at Boca Hawaii. Hope all is well and thanks for all the help and support.